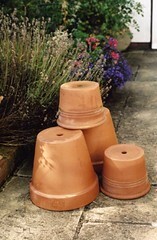 I have to tell you I am loving these clay pots. The possibilities are endless. They are very cheap too. I bought my 12 inch one at Walmart for 7.00. The little ones you can get for a dollar sometimes at the dollar tree. Anyhow this is the latest on my Modge Podge. Again using all my Elle Decor magazines, I sat down and looked for all my color inspiration. That magazine has the best photos. Good thing for me, I was given all those mags because I think it may be pricey otherwise. I used about three different ones to come up with this. The how to is easy. Just cut your clippings of inspiration in different sizes. First I paint the mod podge in sections on the pot. Not sure if I like the pot by the front door, or by the FP what do you think? I like it by the front door. Your so crafty! I love your use of old magazines! It's always so hard to throw out great looking pictures! Modge Podge is the way to go! I love it outside. I want one! Defineetely outside! Love your living room! I really like how that Modge Podge looks. I do the same thing – – – move things around to see how they look. But my "stuff" is pretty blah compared to what I see at your house! Oh – – – but I keep people laughing, so it's all good. I like the pot by the front door. Well, what's the problem dear? You need one in all 3 spots! Just make 2 more! LOL! It's very well done! You really are so talented and make it all look so wonderful! Love it! Oh man I'm so loving the living room….it looks great outside but I also liked it by the fireplace. Great job! Fabulous. I have to admit my favorite place is on the patio outside! I love mod podging my pots and moving them around is all part of the fun! Yours looks fab in all locations. It's the case of the moving pot. lol I move things all around until it looks right, too. I love that pot done like that. Still haven't played with that stuff yet. Isn't mod podge just a wonderful thing! The possibilities are just so endless. ha ha ha, i do that too. definitely front door or porch. too much by the fireplace. looks so unique, so you. looks great. I like by the front door as well. Debbie you doos it again fabulouso idea! I like it by the front door but I also liked it on your porch so I guess you'll have to make another one(LOL)!! Let's face it Debbie, you are going to have to make a couple of more because the modge podge pot with the fern in it looks sooooo great! Better tell hubby to hide the power tools – they might get mod podged! hehe Pots look a-MAZING! Debbie! I am so sorry.. I forgot, I was in a hurry to get my post out and was going out..I have been running around like a chicken without its head.I promise to do better next time ok buddy? lol Oh and I love your pot!I think I like it by the front door also. Love it! Goes great with your decor!!! I knew there was a reason to keep my magazines…we have great ferns up here in the damp NW but I can never grow them inside…yours is beautiful I am jelous..do you have a secret? I have a stack of magazines to get rid of – may have to rethink that! I just found your blog and love it!!! I am your newest follower. I love garage sales too! I started a Twice Owned Tuesday Party that I would love for you to link up sometime. I will love to join your party too! Nice to meet you. Your mod page pot looks so pretty! Is the design water proof or do you use a liner? I love the big fern you have in it. How clever!!! It matches your decor beautifully!!! 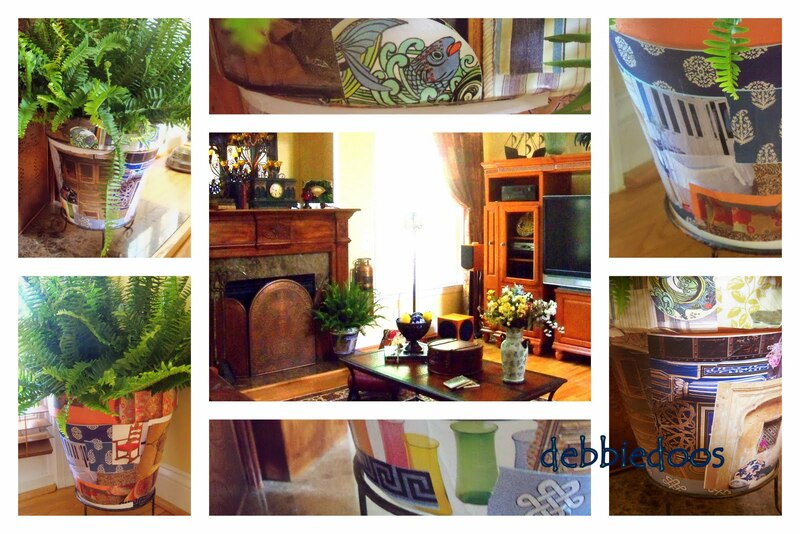 Never thought about decoupaging a pot, Debbie~ great idea! Actually, it looks very cute in all the snaps. Get a few more and place them everywhere! And then, send me one. So so pretty! You go on with that Mod Podge. I love what you did with the pot! Thats lovely, mod podge has magic I always sure about it, it look best outside I think but you have to made 1 or 2 more with different colours schemes so a group of them look more fantastic.. This is great! You rock the Podge! I agree with Wendy's comment! You are amazing with your creativity! I've had Boston ferns before, and I'll bet you moved it outside because it's so hard to keep looking neat! In any case, I love the pot. Happy Blue Monday. What a fantastic job. I liked it in all the places you put it. Great choice of papers! Love the living room. Gorgoeus post Debbie. Your house is gorgeous! I can't help but laugh because I moved stuff all the time. I drive myself crazy! Can't find the right spot if you don't move things! Right? Super cool pot…I just made a black and yellow one with a school bus on it for the bus driver. I liked your pot by the front door. Love your house…it's so grown up! You know what I mean! Hi Debbie, I love it by the front door, looks awesome! You really did a great job! The mod podge planter is too cool! The table is so neat painted blue, too. It's just awesome in each of the three. I like outside. But, think you need to make three now. One for each place. What a grand living room. Do we start to call you Modge now, or still DebbieDoos…. Your have a wonderful house, Debbie! I loved the pot at all the places. Is that a live fern? Hi, as always I just love to stop here at your blog, very good to see you! I've been in the hospital again so I haven't been able to post for a lil over a month. Good to see you! I love your home! Great post! I hope that you have a lovely new week! Great idea! I like how it looks on your porch with the fern. Love your pots. Very clever! The plant is beautiful and looks fab in both places. Lo e you beautiful home. I like it on the porch! You have a beautiful living room. Thanks for sharing. I don't think you can go wrong! It's cute wherever you put it. This is such a cool idea! Your pot is gorgeous – and so is the rest of your home by the peek in the photos! Excellent crafts. You have really used your imagination to put these together. They are really lovely. I actually like it anywhere! What fun! What a cute idea- I LOVE it! You have one cool blog! Love it! Following you from FMBT! Please stop by Dropped Stitches to follow me back! Those are so cute. I am adding them to my favs list. I wish there was a cponsor product used and I would have sent you over to the DIY Clun inc contest. If you have something else to post over there we would love to have you. That is so fun. I love all of your color and the yellow in the back is some of my favs. Elijah's Crib here to follow you! Pinay Mama here to follow you! Wow, these are amazing, they sort of look like mosaics at first glance. Great job! Come by when you can. I was too busy looking at your beautiful home! I agree with every one else! Make more pots for all the spots. (hey that rhymes) I am so glad to see some one else moving things around like crazy. I bet it doesn't stay there for long. Saw your link at the Blue Cricket blog. I love looking at everyone's creativeness. It looks great anywhere.. I am going to borrow this idea. I think it's amazing! Great look! Love all the cool colours which is something you don't always see with clay pots. And what a lovely home I might add! i just love your pots! i used to decoupage a good bit and haven't for a long while. you've inspired me to do a project again. beautiful work!